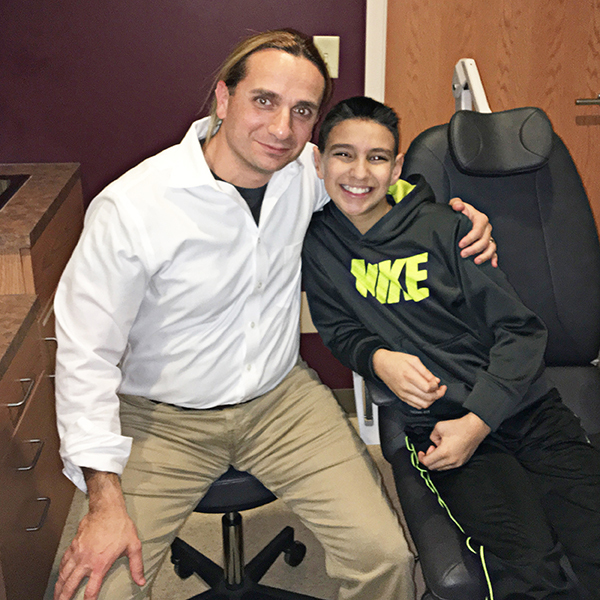 When nine-year-old Antonio Lulla of Toronto, Ohio, went for his regular wellness visit, he failed his eye exam. Just days before, he was passing a football with his father Steve Lulla. Now, the vision in his left eye was gone. Antonio’s ophthalmologist, Kenneth Gainer, MD, a WVU School of Medicine graduate, recommended they see a pediatric ophthalmologist at the WVU Eye Institute to make a diagnosis. The family met with WVU Medicine pediatric ophthalmologist Geoffrey Bradford, MD, who evaluated Antonio and determined that they would need some time to research a diagnosis. When they returned to the WVU Eye Institute for a follow-up appointment, Antonio was legally blind in his left eye. “Dr. Bradford told us that it’s one of those things that you study, but you very rarely ever see it in your practice or your career,” Steve said. “So that’s why it kind of took a little bit of time to accurately diagnose it.” After ruling out several other conditions, Antonio was diagnosed with Coats’ disease. Coats’ disease is a rare eye disorder that usually causes full or partial blindness in one eye due to the abnormal development of blood vessels behind the retina. It’s not a hereditary condition. It usually develops in childhood, and the exact cause of Coats’ disease is unknown. Bradford referred Antonio to WVU Eye Institute retina specialist Ghassan Ghorayeb, MD. He recommended regular eye injections and laser treatments to cauterize leaking capillaries in Antonio’s eye, reduce swelling of the retina, and hopefully, restore his vision. Once a month, the Lullas travelled to Morgantown for Antonio’s eye injections. They continued this treatment regiment for almost three years. Intermittently between the eye injections, he would also receive laser treatments. “My vision was 20/1200 when I first had my eye exam at WVU, and now, it’s amazing how it went from that to 20/20 vision,” Antonio said. His ordeal with Coats’ disease and Ghorayeb’s compassion and expertise have left a big impression on Antonio: He would like to become a retina specialist in the future to help other people as Ghorayeb has helped him. Here at WVU Medicine, we’re saving lives, improving health, and working to make a difference in our state and region. If you have a great story to tell, we’d like to hear it.